The final match of the day that I watched on a fab Sunday order of play was Jelena Ostapenko v Daria Kasatkina out on court 1. Since I had never watched either player before in competitive action, it was a must to get some photos! I’ve also developed a real fondness for Daria and her game style so I was especially excited to watch her. It turned out to be a super match with plenty of drama. It was only after the match concluded that I realised from Twitter some of the stuff that Ostapenko said on the changeover! My brain’s a bit muddled tonight so i’m just gonna post the things that I remember with all the photos. Sooo Kasatkina won the first set, 6-4. She was unable to serve it out, as has often been the case this year, but she broke for the set. 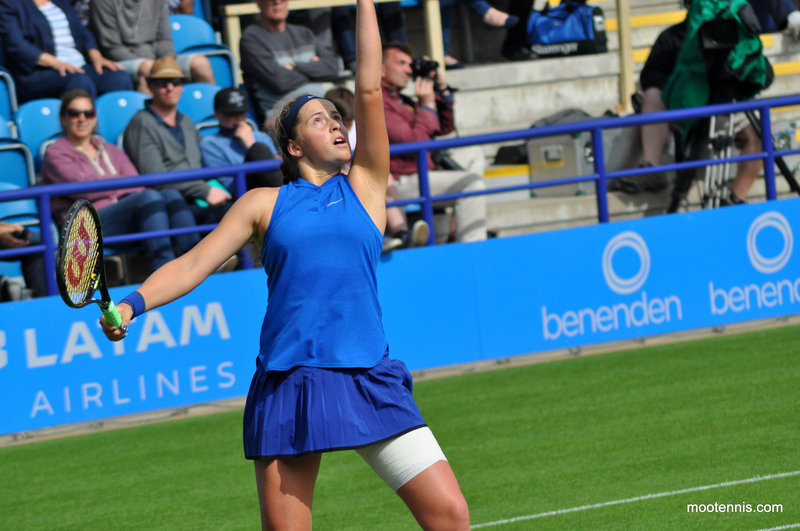 Ostapenko, who was sporting strapping on her left thigh, hit two tame groundstrokes into the net to give away the set. Ostapenko wasn’t clinical in the first set. Take the pictures that follow which document her run up to a short ball which she promptly netted…. And the reaction was priceless! 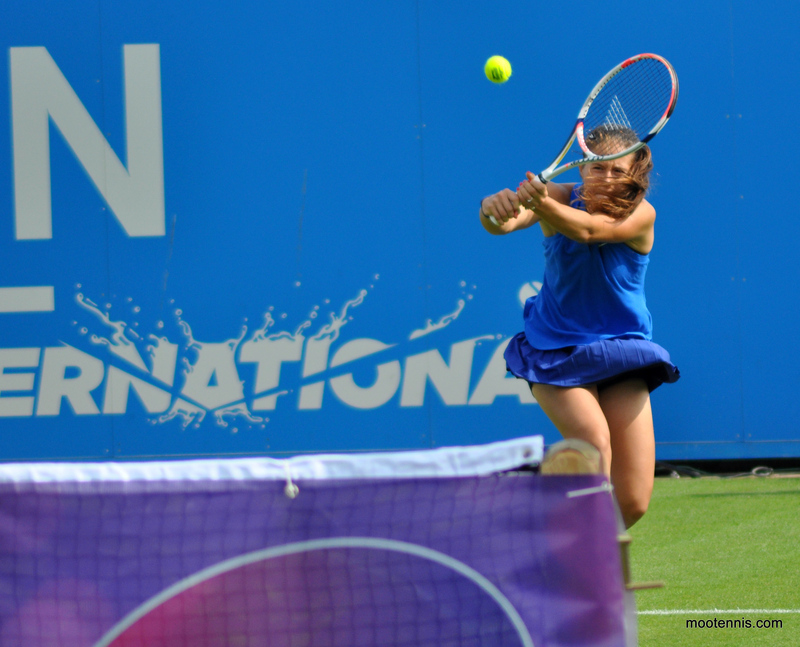 I’m totally taken by Daria’s game… that forehand down the line is a beaut! Sat at court level, I noticed that so many of Daria’s shots looked like they were going long, but dipped in with the topspin at the end. 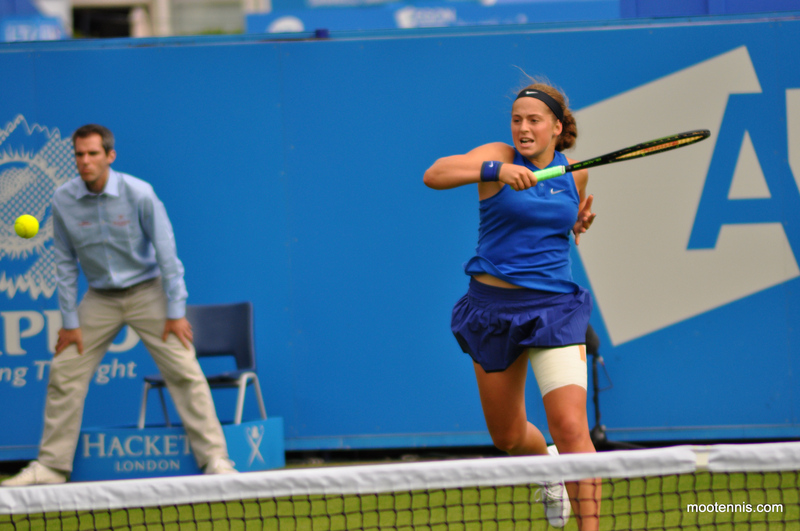 I was impressed how she managed to counteract Ostapenko’s depth and power with her defence (lots of slices!) in the first set. The key game in the match came at the start of the second set. 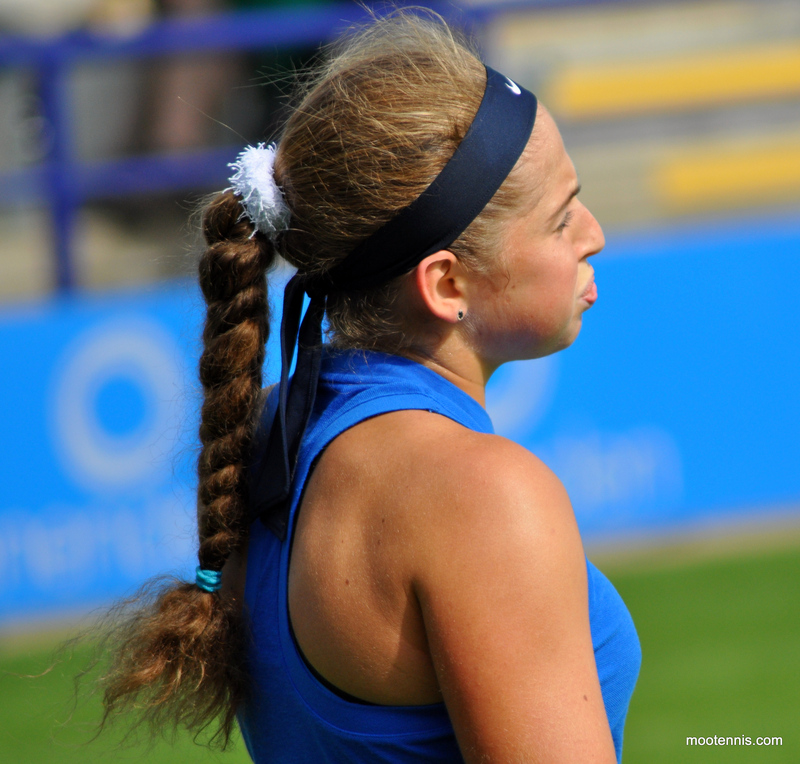 Kasatkina had break points leading 2-1* but Ostapenko secured a gritty hold. 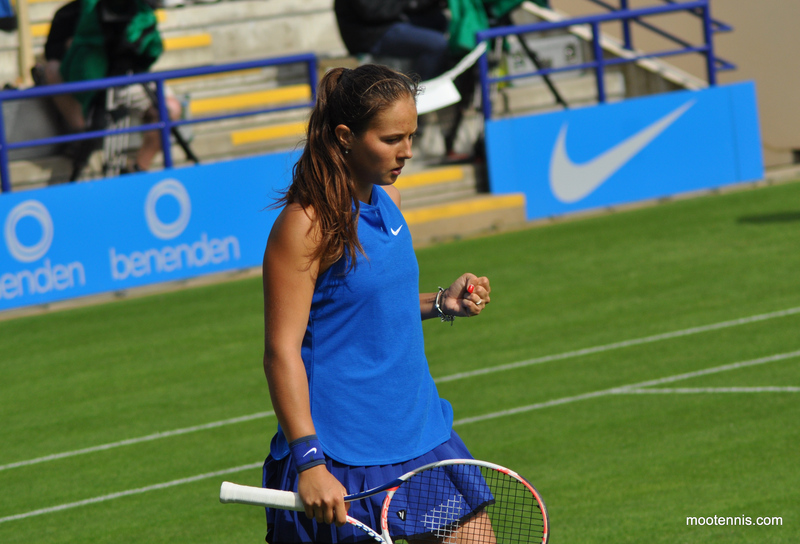 I felt like Kasatkina was on her way to the win if she’d broken then, but the momentum swung. From the first point of Kasatkina’s next service game, I thought uh oh! Ostapenko really found her game in that second set, cutting out the errors and finding the lines. Kasatkina became increasingly passive and fed the Ostapenko conveyor belt of winners. 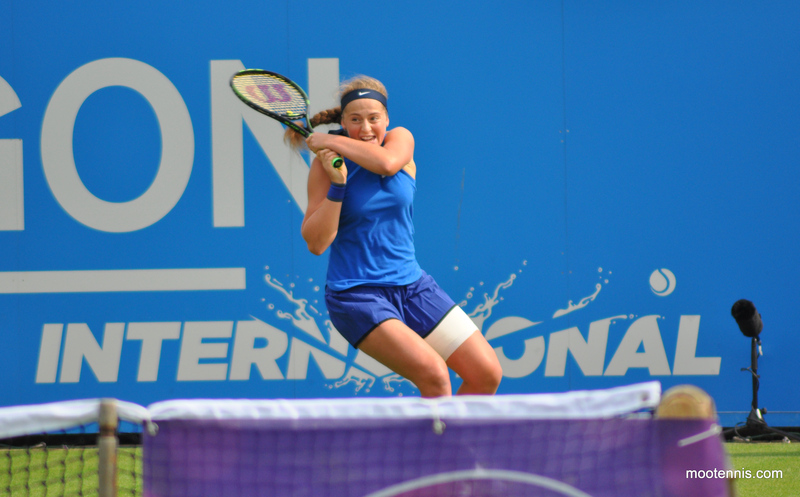 Ostapenko won the second set, 6-2. 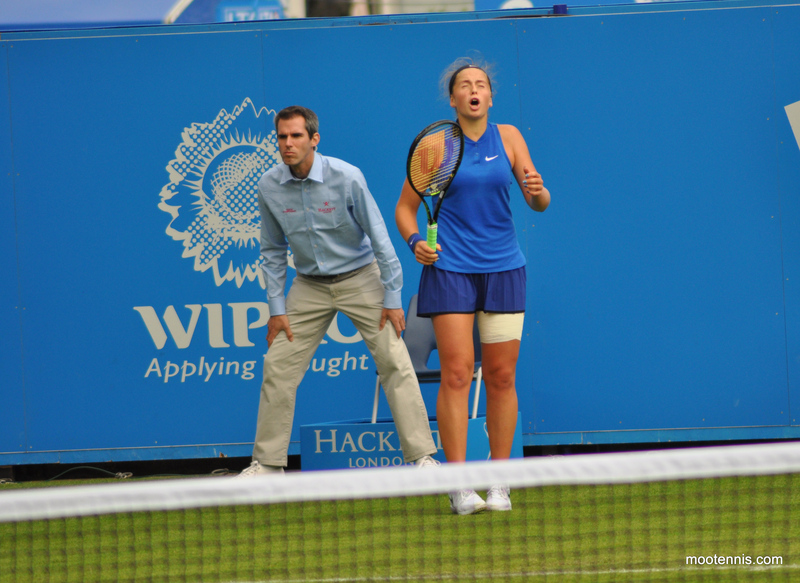 Despite her form improving, Ostapenko was challenging so many line calls with the umpire. Some of them were just baffling that she though they could be in! 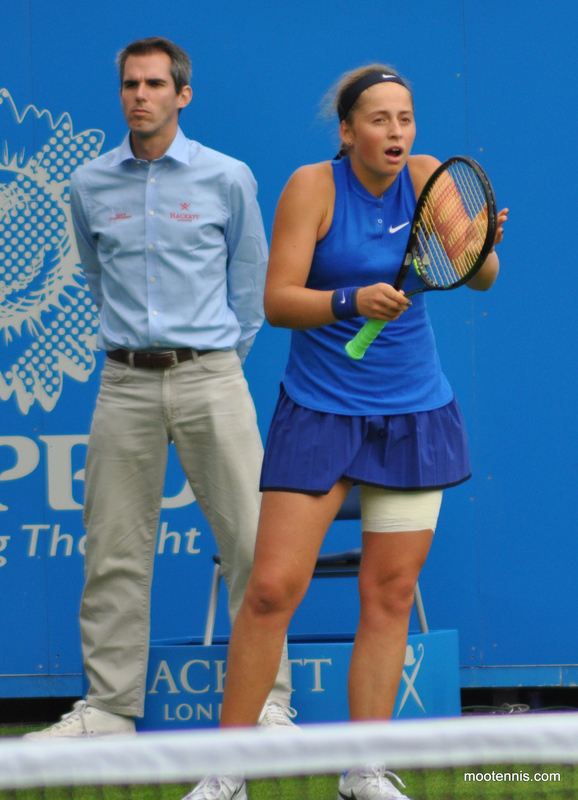 Seriously though, Ostapenko reactions should be a thing because her facial expressions are just hilarious. Kasatkina came back from a toilet break with renewed vigour, getting the early break at the start of the third set. 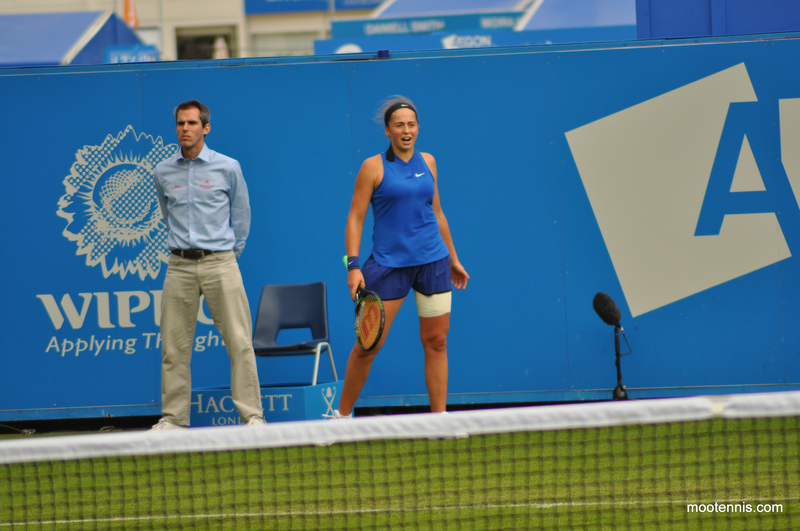 She had some passionate supporters out there and one of them was proper pumped when she won the first set! 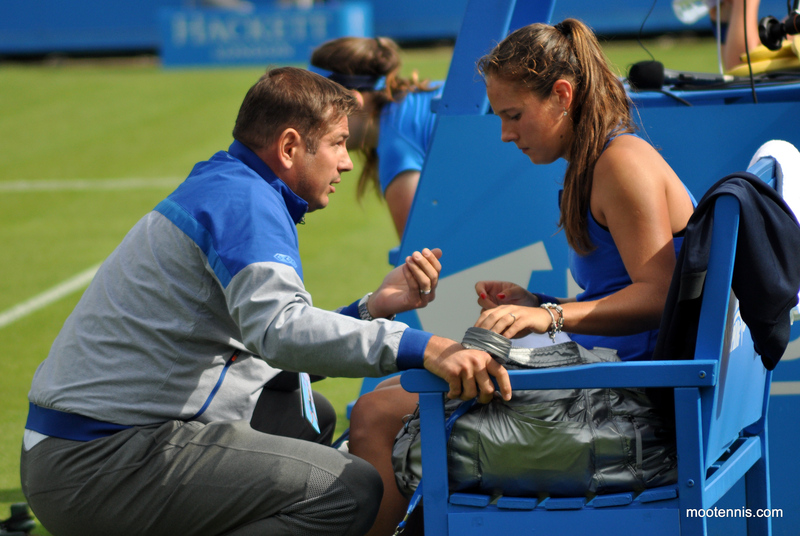 By the way, I love Kasatkina’s relationship with her coach. Behind Lucie-Rob, I think it’s my favourite player-coach partnership on the WTA tour. His advice is so beautifully measured and you can just see her absorbing that information! 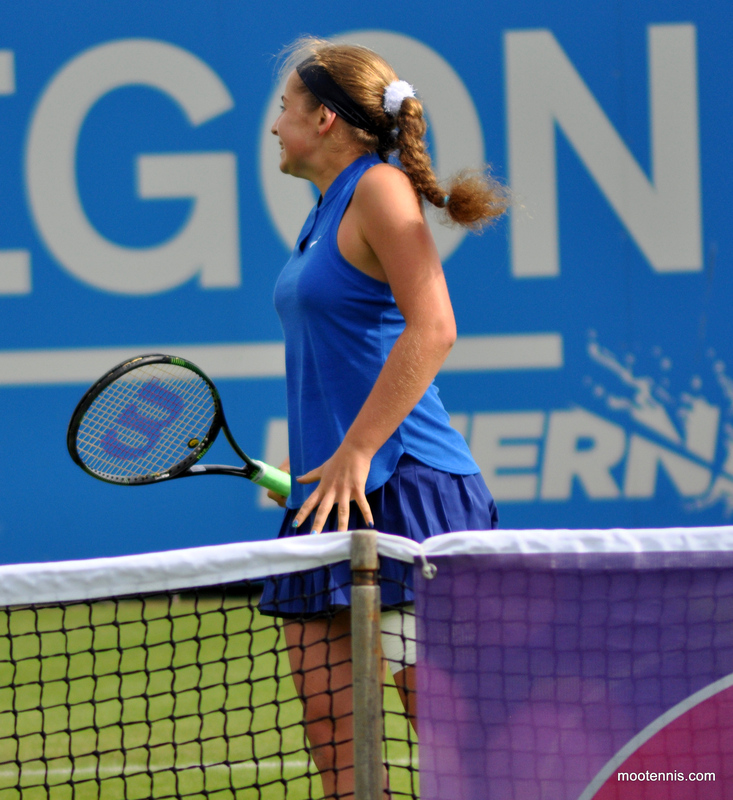 After brief optimism for Kasatkina, Ostapenko reeled off five straight games as the Russian player failed to offer up enough variety as Ostapenko kept finding the down-the-line winners with remarkable frequency. While I found her attitude at times rather frustrating, sometimes you just have to say too good! And Ostapenko wrapped up the win, 4-6 6-2 6-3 in one hour and 58 minutes. It was a super entertaining match with a nice contrast of styles. I’m chuffed to have got some pictures of both players now! I want to watch Daria on clay, meanwhile I think Ostapenko, love her or hate her, is one to circle for Wimbledon. 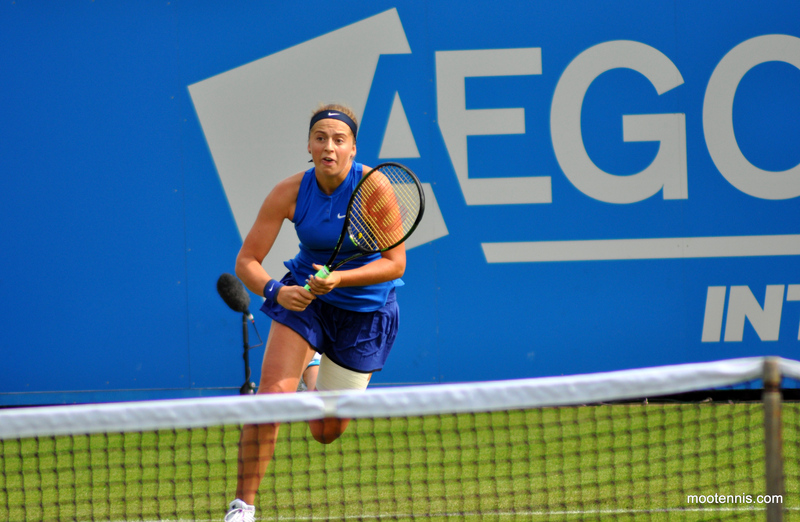 Ostapenko plays Dominika Cibulkova in the second round which could be TREMENDOUS. Domi was watching most of this match, wrapped in many towels. I could have done with one, I stupidly decided not to wear a jacket today. It was sunny but MY GOD THE WIND. I’ve still got a lengthy round-up to bring you from the practice courts on Sunday. There’s pictures and accounts of Timea, Lucie, Sam, Caroline and Belinda to come! Since the weather forecast is terrible for tomorrow, i’ll leave that for tomorrrow morning. 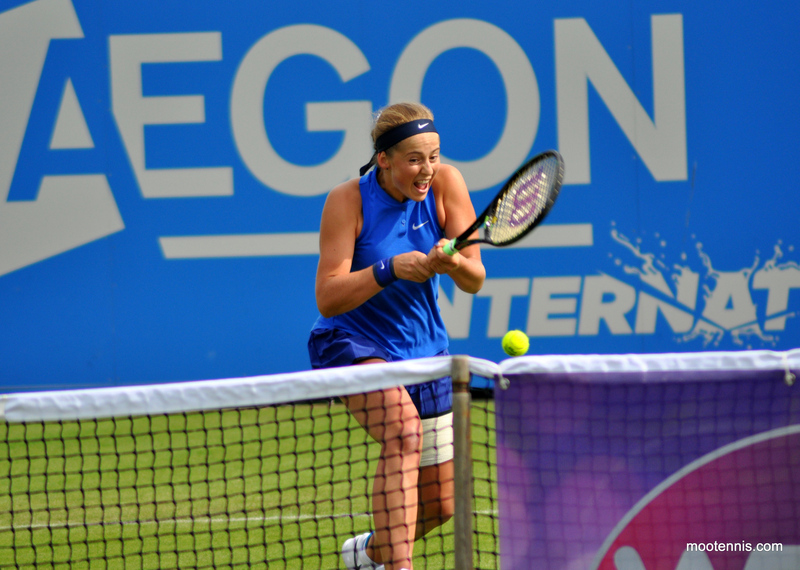 June 19, 2016 in Eastbourne, Kasatkina, Ostapenko, Tournament Report, WTA. Glad you had a nice day two in Eastbourne James!!! I guess you will be there for Petra and Caro’s matches, the only 2R matches scheduled today? Thanks Silas! Petra and Time on at the same time, don’t know what I’m going to do haha! Some very good photos on here. 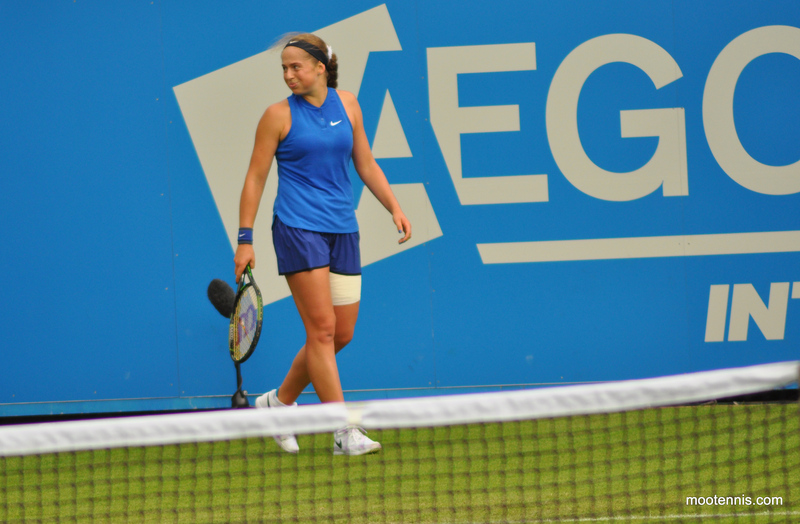 I have read comments on twitter and other sites about Ostapenko and she is not very popular and I can understand why. I do not expect her to get many wild cards if she needs one ! I agree with your comments about Daria who looks a real natural and is entertaining to watch. She plays the type of tennis that I like and has a good attitude. She also seems like a nice genuine person which helps. I have not seen much of the Lucie-Rob coaching partnership but I also really like the way that Daria looks her coach in the eye and listens and responds which is something that some other players do not do. 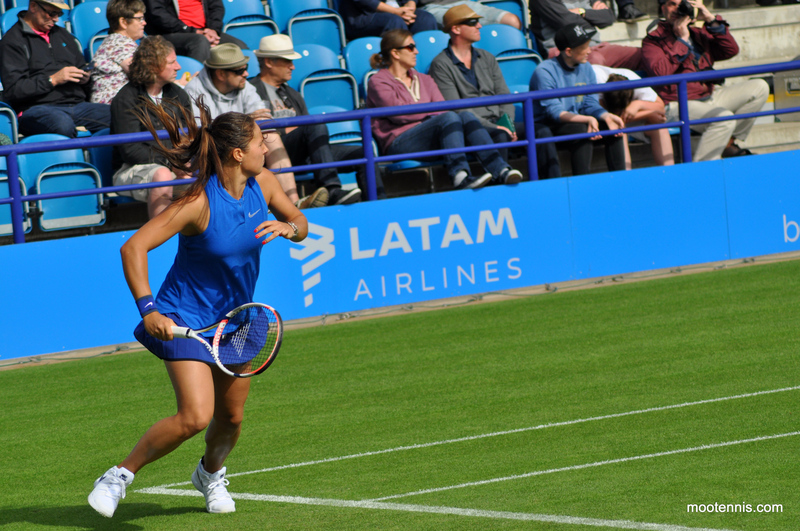 Daria has not yet done as well this year as some pundits predicted but I think that she is the type who will take time to mature as a tennis player and will improve with experience. Thanks, Peter! Agree with all your comments. I love how Daria takes on board everything from her coach, you can she’s totally engaged.